We share a passion for providing children with an exceptional education. Hollis Montessori relies on gifts of all sizes from faculty, board, parents, grandparents, alumni and community members to bridge the gap between what tuition covers and the cost of a quality AMI Montessori education. The Annual Fund ensures that Hollis Montessori’s educational programs and thoughtful investments in faculty and facilities are maintained and strengthened for years to come. Many have questions about the Annual Fund. Before making your donation, please take the time to read through these questions and answers and let us know if there is any additional information you need to help make a more educated donation. Two easy ways to donate: Return the donation envelope to the school, or donate online now. Why do we have an Annual Fund? Along with the Spring Gala & Auction, the Annual Fund is a significant component of Hollis Montessori School's Annual Giving campaign. A full tuition at Hollis Montessori only covers roughly 85% of the cost of educating each student. 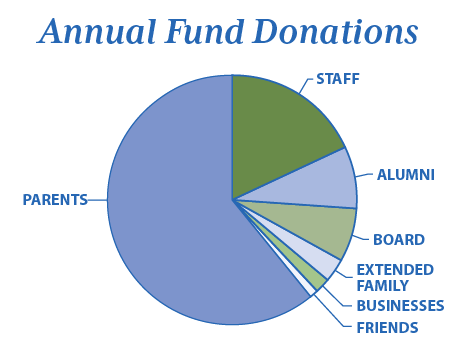 Funds received from Annual Giving are the school’s most important source of revenue other than student tuition. It is a vital part of the operating budget, contributing to classroom materials, supplies, salaries and faculty professional development. Annual Fund gifts enable us to attract and retain the best teachers, provide quality materials, and provide our students with a wide variety of diverse experiences. In brief, these funds are used to run the school. Why not just raise tuition? If Hollis Montessori relied solely on tuition income, we would price ourselves beyond the means of many families. In addition, gifts to the Annual Fund are tax-deductible, while tuition is not. Unrestricted annual monetary gifts enable Hollis Montessori to maintain high quality programs and facilities, attract and retain top-notch teachers, and help keep tuition affordable. Through annual giving, every student is subsidized through the generosity of our larger community. Yes. Hollis Montessori School is a non-profit organization. All gifts made to the school are tax-deductible. The Hollis Montessori Tax ID Number is 26-3041656. Yes. Annual Funds are common practice among independent schools to compensate for expenses not covered by tuition. 90% of independent schools operate on a tuition gap basis where the tuition is 10-25% less than total expenses. These schools depend entirely upon their annual funds to cover the gap for budgeted expenses. Why do we request all members of our community to make a donation? Outside funding sources and individuals are much more willing to consider supporting Hollis Montessori if it is demonstrated that those who know the school best have generously given to support it. Last year we had 100% participation by the Board of Directors, faculty and staff. Hollis Montessori School community participation is crucial as we seek funds from outside sources, such as grants, foundations, matching programs, gifts from trusts, or individuals. Gifts of every size are gratefully appreciated. Only you can determine the amount that is right for you and participation is more important than the amount. We ask that you please give as generously as you can. This year we are striving for 90% parent participation. An investment in Hollis Montessori School is one that will pay life-time dividends for your children, your community and for future generations. Every gift matters. WHO ORGANIZES THE ANNUAL FUND? This effort is entirely volunteer-driven. Gifts are solicited by the Annual Fund committee who makes calls, writes letters, sends mailings, and works in collaboration with the administration and board, ensuring that 100% of all gifts received go directly to the school. WHY DO WE REQUEST ALL MEMBERS OF OUR COMMUNITY DONATE? Outside funding sources and individuals are much more willing to consider supporting Hollis Montessori if it is demonstrated that those who know the school best have generously given to support it. We are proud to share that the last three years we have had 100% participation by the board of directors, faculty and staff. We have also almost doubled parent participation in the last two years, reaching 83% participation last year. Hollis Montessori School community participation is crucial as we seek funds from outside sources, such as grants, foundations, matching programs, gifts from trusts, or individuals. There are many ways to support Hollis Montessori. You can donate by cash, check, credit card, or online through our website. You may also donate stocks or consider making a gift in someone else’s honor or in memory of a loved one. Many donors take advantage of their employers' matching gift program, which may double their gift to the school. If you have any questions, please ask! In addition, we hold our “State of the School” meeting in January to present information concerning the past, present, and future growth of Hollis Montessori School.